​Our little Roundabout is our latest purchase and project, having been bought in early October 2015. It's a small handy 10ft. 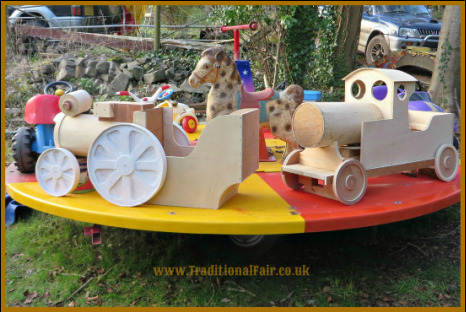 diameter, fold up, trailer mounted ride, we are renovating and is suitable for small children, up to the age of 6, perfect for all events, kids parties etc. and due to it's small and narrow size, can be wheeled in to smaller areas. It will be hand cranked, by turning the mangle type handle and will feature pedal cars, a 'Showman's' traction engine, train, scooter amongst others to ride upon and styled in the 1950's/60's period. We hope to have this available to hire later in 2018.